Rep. Keith Ellison (D., Minn.) trails Republican opponent Doug Wardlow by 7 points in Minnesota's attorney general race, according to a new poll. A Star Tribune/MPR News Minnesota survey found Wardlow with 43 percent support to Ellison's 36 percent, with roughly one in six voters undecided. It represents a 12-point swing from a Minnesota poll last month showing Ellison with a five-point advantage. Ellison is much more of a known entity in the state as a six-term congressman and national profile from being deputy chairman of the Democratic National Committee. Some of the support for Wardlow stems more from opposition to Ellison, the Star Tribune reported. More people said they are aware of Wardlow compared to last month, but nonetheless fewer than half the people who took part in the survey said they recognized his name. "It’s more that Keith Ellison scares me," said Dave Theis, 56, a farmer from Jordan. He fears Ellison will file "endless lawsuits" against President Donald Trump’s administration, which he worries could cost Minnesotans millions. The new poll showed a reduction in women's support for the Democrat. Last month, he led Wardlow 46-to-30 percent with women, but now his lead is at 39-to-38 percent. Ellison has denied allegations by ex-girlfriend Karen Monahan that he emotionally abused her during their relationship and once dragged her off their bed during a fight. An investigation by the Democratic-Farmer-Labor Party found no corroborating proof for her claims. The poll was conducted Oct. 15 through 17, meaning it was primarily done before the release of Ellison's divorce file. It did not show he abused his former wife Kim, but it did show him saying Kim often hit him during their marriage. 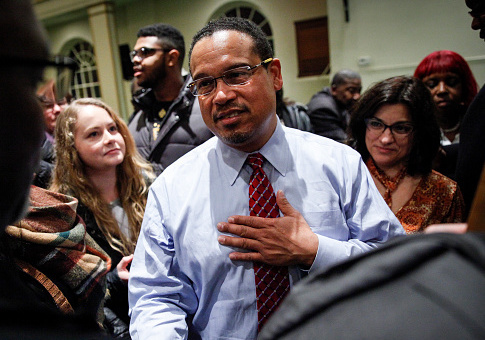 Ellison's relationship with radical Nation of Islam leader Louis Farrakhan has also come under scrutiny. He received "Four Pinocchios" from the Washington Post Fact Checker for claiming he had "no relationship" with Farrakhan, who has made numerous anti-Semitic, homophobic and racist statements. Minnesota is not considered a swing state—it hasn't given its electoral votes to a Republican presidential candidate since 1972—but President Donald Trump nearly carried the state in 2016, losing by just 45,000 votes. Wardlow served one term in the Minnesota State House and is known for his work with the Christian advocacy group Alliance Defending Freedom.